Well, there’s no going back now. The West Wing is most definitely kaput and I’m feeling elated about it, in a weird & slightly hysterical manner. I keep looking at it and laughing, not *quite* believing it’s almost all gone. First the beautiful roof slates came carefully off, stacked ready to be re-used in the same pattern when the roof goes back on. 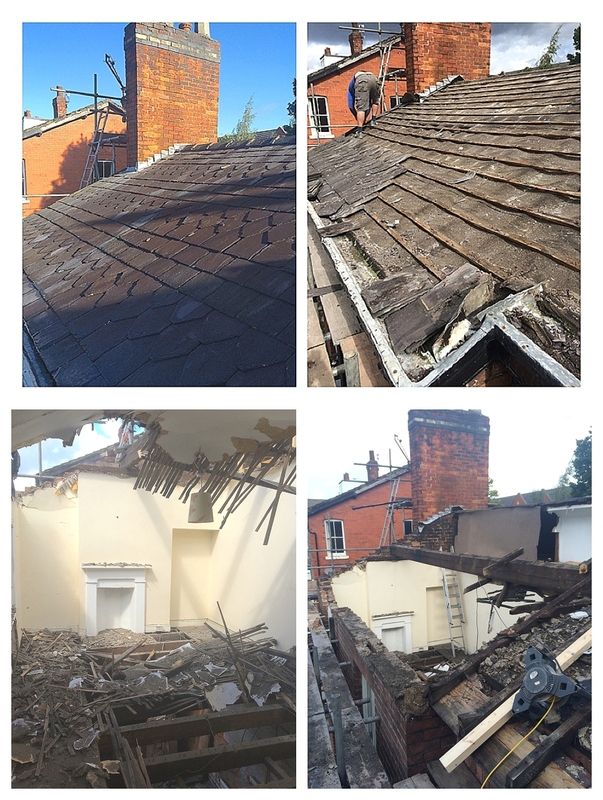 Then on the right you can see the roofing lats (horizontal timbers) and the old roofing felt under it. There are going to be two mini dormer windows on this section of the roof and the brickwork underneath is so bad that the whole thing is being demolished. Taking old ceilings down is such a mucky business, have you ever done it? All old lath and plaster ceilings (bottom left image above, the slatted bits) end up filled with blackness which stays in your ears and up your nose for days! Working from the top down the demolition team took off the roof of the West Wing first floor bedroom, the room with the fireplace in above, then worked back into what was our only bathroom. 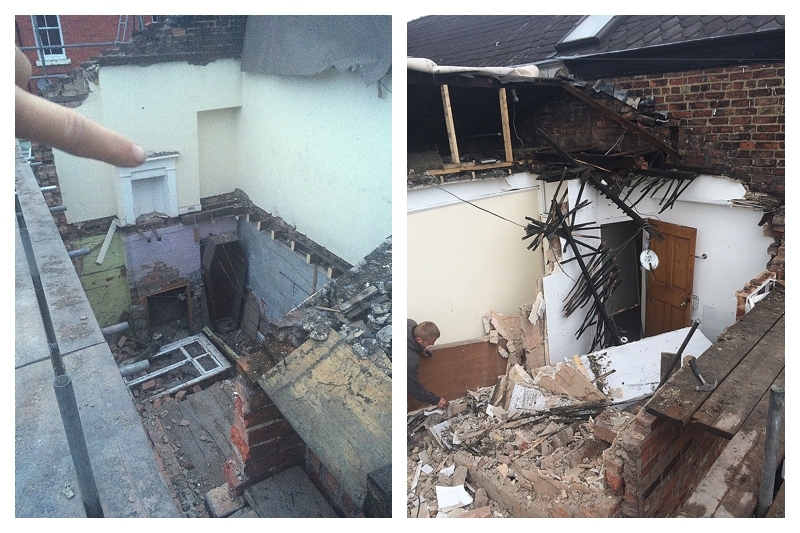 You can see below where we’d got to last night, with the brickwork to the front elevation almost gone. Me & Charlie cleaned off over 500 bricks ready to be re-used in the new construction – put it this way, I won’t be doing a hand commercial anytime soon 😉 Last night, when everyone had gone for the day and Mr M & I climbed up onto the scaffolding in our onesies, surveying what was once part of our home, it was strange to take in. Staring down into the abyss where the kids had once slept and we’d only last weekend showered felt even with my building experience, a little surreal. good work with the bricks! must be exhausting to remove all that mortar! Yep, brick spinning is touch on the wrists and elbows, not to mention the hands no longer being soft & gentle! !